Drizzle mixes with an aura of briny ocean as my family and I step aboard the metal gangway leading to the MV Columbia docked in Auke Bay near Juneau. Lugging backpacks, a cooler of food, and plenty of card games and books, we’re ready for a four-day journey that will take us from Alaska’s capital city south to Bellingham, Washington, courtesy of the Alaska Marine Highway System ferries. General information: The 2017 sailing schedule is now available at ferryalaska.com. Reservations can be made via the website planning tool or by calling 800-642-0066. Look for specials throughout the year on select routes. Rates: Tickets for ferry passage range from single-person, walk-on fares for those traveling alone to large group fares for those traveling together. Rates are determined based upon vehicle length, onboard overnight accommodations and itinerary. Children age 6-11 are half price, and kids under 6 are free. Routes: Ferry travel can be confusing to arrange, even with the help of the Alaska Marine Highway website. If you’d like to take time to visit coastal communities in depth, ask the AMHS reservations agents to assist you with multiple tickets for multiple stops. As ferries only travel on certain days between cities, it is imperative to have help with arranging each leg of your journey. As we unpack, a blare of the Columbia’s horn sends us out to the upper deck to watch the ferry crew toss lines and bustle around the vessel, making way for our departure. Gulls swoop overhead and onlookers in smaller boats wave to the crowds along the ferry’s rail. 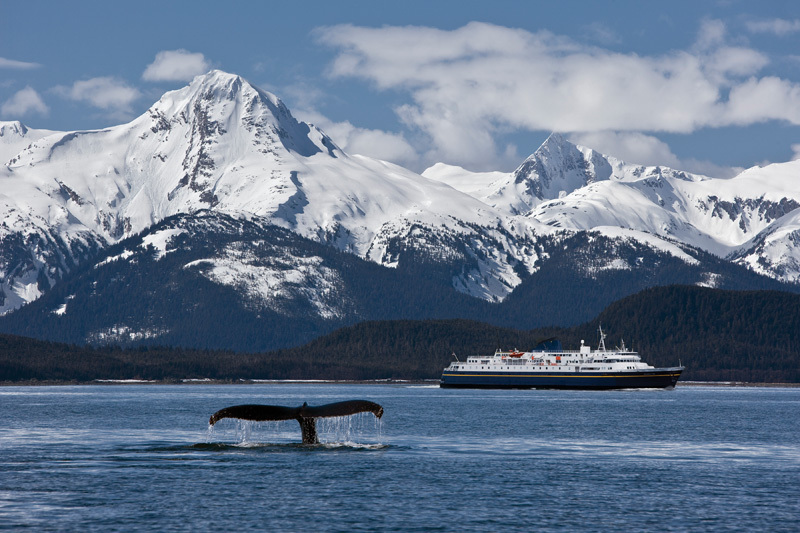 Like passengers on an ocean liner, we wave back merrily, filled with anticipation of the upcoming voyage through Alaska’s famous Inside Passage. Each year, nearly 300,000 people travel aboard AMHS ferries, savoring the views, wildlife and access to places few visitors see. A trip aboard one of the 11 vessels along the 3,500-mile route is a journey into the heart of the Last Frontier. For example, the Southeast Route serves scenic Inside Passage communities like Juneau, Skagway, Sitka and Petersburg, sharing waterways with cruise ships and pleasure crafts during the busy summer season. Looking for interesting sights and jump-off points to other Alaska activities? This is the route to choose, particularly with children anxious to hike, fish or explore the historical and cultural aspects of this panhandle section of Alaska. 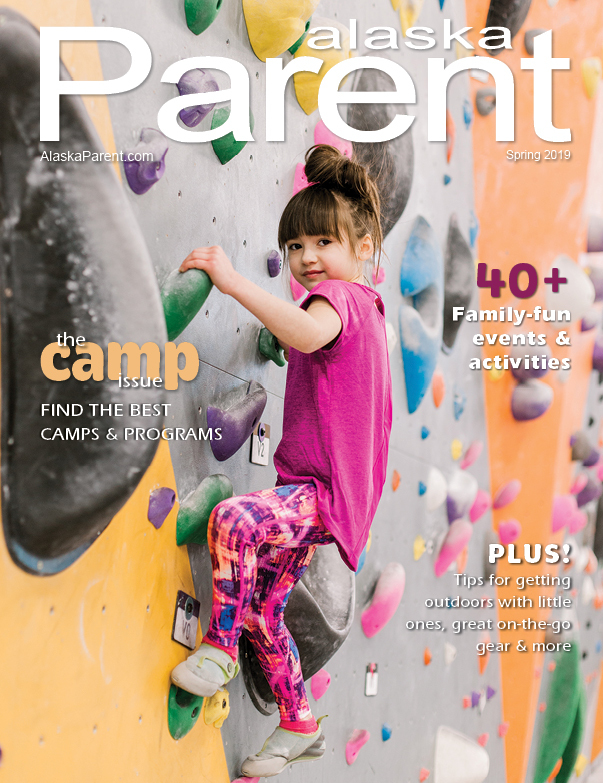 Juneau, of course, is our state capital and the starting point for many families looking to take advantage of direct flights from Anchorage. Skagway is home to the Klondike Gold Rush National Park, which has Junior Ranger programs provided by the National Park Service, and an interpretive center dedicated to kids. Sitka is our favorite stop for diving deep into Alaska’s earliest days, as this city was the site of the transfer of ownership from Russia in 1867. The Southeast Route is also the route to choose if you’d like to travel all the way south to Bellingham, Washington. It’s the most popular and always sells out between May and September, so early planning is a must. Farther north lies the Southcentral Route, where those living in Anchorage have a connection to coastal travel. 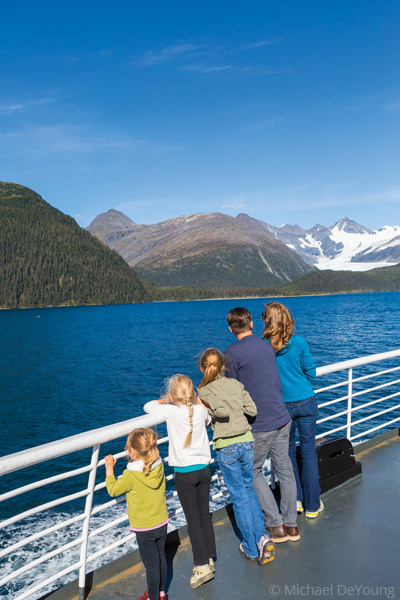 If traveling from Whittier, try a ferry-drive weekend trip to Valdez across Prince William Sound, where you can indulge in some world-class angling or hike around the historic Old Town Valdez site before driving the scenic Richardson and Glenn Highways back to Anchorage. For those with more time, try a departure from Homer to Kodiak – a 10-hour trip but one worth the journey once you arrive on the Emerald Isle. Explore Alaska’s past and present military presence with historic Fort Abercrombie State Recreational Area available for camping, hiking and beachcombing. There’s even a military museum located in an old restored bunker, telling the story of World War II efforts on Kodiak Island. For the truly adventurous, the Southwest Route is a test of seafaring mettle. This four-day journey from Kodiak to Dutch Harbor, available May through September, can be rough, but the rewards are great. Sailing from Kodiak Island to the Alaska Peninsula and then “down the chain” of the Aleutian Islands to Dutch Harbor, the Southwest Route is a window into the lives and culture of rural coastal Alaska. See fishing boats readying for their rough-and-tumble season, visit with kids who attend a school with only six students and walk beaches where World War II soldiers spent long, lonely months during the early 1940s. It’s beautiful, raw Alaska, and it rates as my family’s favorite of all. During our first ferry trip around Southeast Alaska, we secured a stateroom and promptly decided this was our preferred mode of travel for the two weeks we planned to be on and off various vessels, kindergartener in tow. Not only were accommodations comfortable, they were clean and allowed us the luxury of not carrying sleeping bags, pads and pillows to each new ferry we boarded, since they can be rented for a small fee. Staterooms come in a variety of configurations and price ranges and sell out quickly, so be prompt (and often flexible) with reservations and dates. 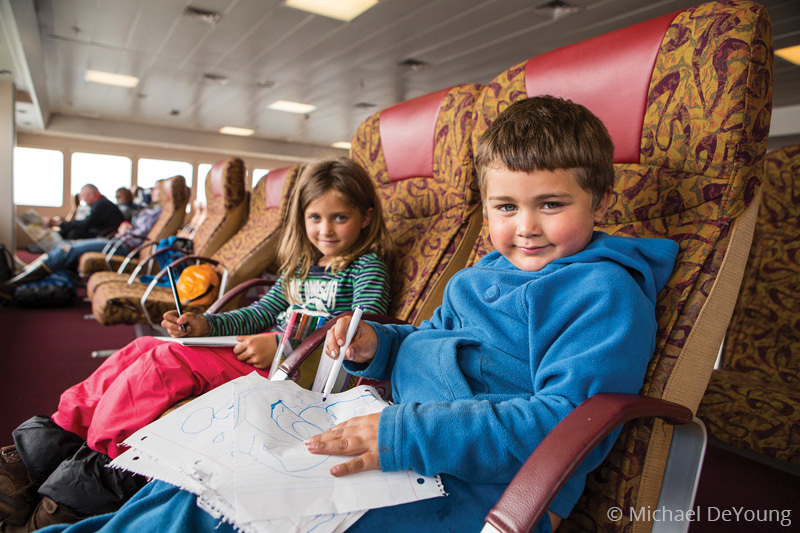 Passengers are welcome to utilize ferry common areas for a family slumber party as well, but it is often crowded, and crewmembers are vigilant about quiet hours, neatness and forbidden food anywhere signs are posted. That said, hundreds of families camp out each year indoors and out, and many have said it’s their favorite part of ferry travel. It is even considered a rite of passage for many people to pitch a tent on the top deck of some vessels, but be sure you have experience camping in foul weather before you set up camp topside, and bring a roll of duct tape to secure your shelter. Feeding your family is fairly simple, however, and doesn’t require any seafaring or camping experience. We dined in the cafeteria once a day and relied upon microwavable foods like potatoes, chili, soup and oatmeal for other meals. Some vessels have a full dining room or cafeteria (cheeseburgers and fries are the superstar menu items). If you’d like to bring a cooler, ice is available, but we found gel packs to last longer and cause less mess. Bring your own plastic plates and cups, but napkins and other sundries are available from the cafeteria. I am often asked by dubious parents if staying onboard for an entire day or more is too tough for wiggly kids, especially toddlers and babies. My answer is that it depends upon the child and your style of travel. For us, ferry travel offers the chance to play card games, watch movies in the onboard theater, and spend hours scanning the horizon for wildlife and other boats. Expect to see some stunning scenery: Watch for humpback whales, seals, bald eagles and even a glacier or two. Common areas are perfect for a round or two of Monopoly or Uno, with other youngsters often joining the fun. Ferry stewards anticipate restless passengers and provide at least three or four showings of popular movies and historical documentaries about Alaska. The highlight of the trip, for antsy and calm kids alike, is stepping off the ferry to visit the port communities. We’d walk through town, visit local parks and do a bit of shopping for our picnic basket. When the ship’s horn blasted once, we knew we’d better hustle back on board and get ready for the next adventure. This is the Alaska that people come to see, and the Alaska that residents hold close. 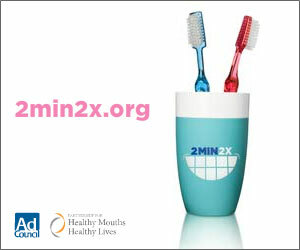 Why not experience it together in a completely new way?